We would be glad to meet you at the IRF Global R2T Conference & Expo taking place on 7-9 November 2018 in Las Vegas, Nevada. The Conference is taking place at Tropicana Hotel & Resort and you can find more info on RUCONBAR at the stand A58 of the Expo. We are participating at SVIIF 2108 (Silicon Valley International Invention Festival 2018) in Santa Clara Convention Center, California, from 02 to 04 July 2018. 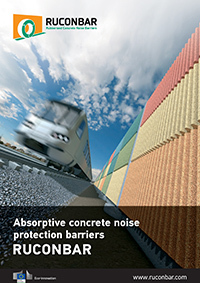 If you would like to get more information on RUCONBAR noise barriers, this is the right place to get started. Please visit us at the exposition stand of Croatian Union of Innovators. Looking forward to meeting you! Come and visit us at 44th International Innovations Fair, Geneva, Switzerland, the world’s oldest and largest innovations fair. You will be able to find first hand information related to RUCONBAR on our info stand at Palexpo Hall 7, stand of Croatian Union of Inventors. Looking forward to meeting you! Come and visit us at InnoTrans 2014, Berlin, the world’s largest trade fair focused on the rail transport industry. You will be able to find first hand information related to RUCONBAR on our info stand at Hall 25 / Booth 315, inside the edilon)(sedra group exhibition space. Looking forward to meeting you at Innotrans! RUCONBAR has been presented in a panel discussion as well as on an exhibition stand at the National CIP Eco-Innovation Info Day in the Croatian Chamber of Economy, held on 15th May 2013.